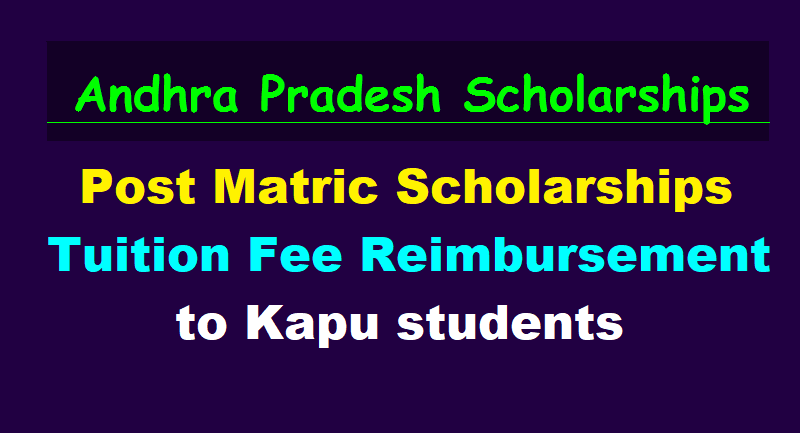 AP Post Matric Scholarships, Tuition Fee Reimbursement to Kapu students 2017-2018, Reimbursement of Tuition Fee and Post Matric Scholarships (PMS) to Kapu, Telaga, Balija, Ontari caste students studying Intermediate, Degree, P.G. and Professional Courses. Scholarship amounts. Implementation of Students Scholarship Programme (SSP) for the economically backward Kapu students in Andhra Pradesh on par with AP Students Scholarship Programme is implementing for BCs / EBCs through Jnanabhumi portal. Government Of Andhra Pradesh :: B.C.Welfare Department - APSKWDC Ltd. - Post Matric Scholarships - Sanction of PMS to Kapu, Telaga, Balija and Ontari caste students studying Intermediate, Degree, P.G. and Professional Courses with effect from the academic year 2017- 18 - Orders - Issued. 1. G.O.Ms.No.90, Social Welfare (Edn.2) Department, Dated 30.07.2002. 2. G.O.Ms.No.143, Social Welfare (Edn.2) Department, Dated.15.07.2008. 3. G.O.Ms.No.58, B.C.Welfare (B2) Department, Dated.7.11.2008. 4. G.O.Ms.No.16, B.C.Welfare (C) Department, Dated.17.05.2016. 5. From the Managing Director, A.P.State Kapu Welfare and Development Corporation Ltd., Vijayawada Lr.Rc.No.177/2016, Dated. 04.09.2017 & 06.10.2017. 6. From the Director, B.C.Welfare, A.P., Vijayawada Lr.Rc.No.06.10.2017. In the reference 4th read above, orders were issued among other schemes for implementation of Students Scholarship Programme for the economically backward Kapu students in Andhra Pradesh. 2. In the reference 5th read above, the Managing Director, A.P.State Kapu Welfare and Development Corporation Ltd., has proposed for sanction of Post Matric Scholarships on par with B.C.Students and also proposed to entrust the implementation of scholarships programme to the Department of B.C.Welfare, as the B.C.Welfare has been implementing students scholarship programme for BCs / EBCs through Jnanabhumi portal and they have necessary manpower both at the Head Office and District Office level. 3. Post Matric Scholarships and Tuition Fee Reimbursement to Kapu students: In the reference 6th read above, the Director, B.C.Welfare has also proposed for sanction of Post Matric Scholarships on par with B.C.Students and also proposed to implement the Reimbursement of Tuition Fee to the Kapu students from the Kapu Corporation funds from the financial year 2017-18. Further, it is also ordered that, the Reimbursement of Tuition Fee to the Kapu, Telaga, Balija and Ontari caste students under EBC category shall be implemented from the Kapu Corporation funds under the Head of Account:2225-80-800-11-45-Welfare of Kapus instead B.C.Welfare funds w.e.f. the financial year 2017-18. 6. The Director, B.C.Welfare, A.P., Vijayawada will implement the Student Scholarship Programme and Reimbursement of Tuition Fee to the Kapu, Telaga, Balija and Ontari caste students. 7. The Managing Director, A.P.State Kapu Welfare and Development Corporation Ltd., and the Director, B.C.Welfare, A.P., Vijayawada shall take necessary action accordingly. 8. This order issues with the concurrence of Finance (FMU-Welfare.2) Department vide their U.O.No.FIN-40027/33/2016, Dated.13.11.2017. AP Post Matric Scholarships, AP Tuition Fee Reimbursement, AP Students Scholarship Programme, AP SSP, AP PMS, AP Fee Reimbursement, AP Jnanabhumi portal for Post Matric Scholarships, JnanaBhumi AP Post Matric Scholarships Web Portal - jnanabhumi.ap.gov.in (land of knowledge), How to apply for JnanaBhumi Post matric Scholarships at J SAF JnanaBhumi Scholarships web portal, How to fill the JnanaBhumi Scholarship Application Form(J-SAF) at JnanaBhumi Scholarship web portal, JnanaBhumi AP Post Matric Scholarships Web Portal: jnanabhumi.ap.gov.in and JnanaBhumi AP Post Matric Scholarships Sanction, Disbursement Guidelines and more details given in the above mentioned links.